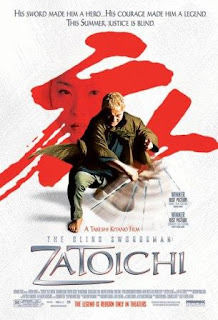 The blind masseur and former samurai Zatôichi (Takeshi Kitano) is drifting and arrives in a small village dominated by three tyrannical lords, Inosuke Ginzo (Ittoku Kishibe), Tashichi Ogi (Saburo Ishikura) and Funahachi (Koji Koike). He helps an old woman and she lodges him at her home. Zatôichi gambles and the old lady's nephew, a complete loser, becomes close to him and Zatôichi helps him in the bets. They meet the geishas Seitaro 'Osei' Naruto (Daigorô Tachibana) and Okinu Naruto (Yuuko Daike), actually a brother and a sister that have been chasing the killers of their parents, Inosuke, Tashichi and Kuchinawa, for ten years seeking revenge. When the ronin Shinkichi (Gadarukanaru Taka) offers his service of bodyguard to Ginzo, the boss decide to destroy the Funachi gang and join to Ogi later. But Zatôichi decides to help the village and get rid off the criminals.